Preventing genocide is one of our biggest challenges. James Waller, Professor of Holocaust and Genocide Studies at Keene State College, says a human problem has a human solution. 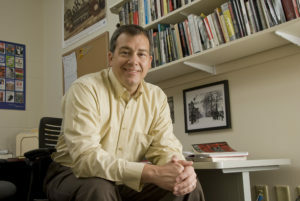 Dr. James Waller is the Cohen Professor of Holocaust and Genocide Studies at Keene State College (NH). Keene State College is home to the Cohen Center for Holocaust and Genocide Studies, one of the nation’s oldest Holocaust resource centers, and also offers the only undergraduate major in Holocaust and Genocide Studies in the United States. Waller is a widely-recognized scholar in the field of Holocaust and genocide studies and, in addition to holding visiting professorships at the Technical University in Berlin (1990) and the Catholic University in Eichstatt, Germany (1992), has been an invited participant in international seminars hosted by the Stanley Burton Centre for Holocaust Studies at the University of Leicester in England (2006); the Institute of Sociology at Jagiellonian University in Krakow, Poland (2007 and 2008); the Bundeszentrale fur politische Bildung in Berlin, Germany (2009); the VU University Amsterdam in the Netherlands (2009); the University of Alberta in Canada (2010); and the Institute of Advanced Legal Studies in London (2011). Waller has been awarded summer fellowships by, and been a teaching fellow with, the Holocaust Educational Foundation at Northwestern University (1996 and 2007-2012) and at the Center for Advanced Holocaust Studies at the U.S. Holocaust Memorial Museum in Washington, D.C. (1999, 2003, and 2005). For spring 2017, he has been named Honorary Visiting Research Fellow at the Institute for the Study of Conflict Transformation and Social Justice at Queen’s University in Belfast, Northern Ireland. Waller is the author of the 2016 book Confronting Evil: Engaging Our Responsibility to Prevent Genocide, published by Oxford University Press. Genocidal destruction is not an easy story to tell, nor is it an easy story to hear. It is, though, a story that must be told and heard. Today – as atrocities impact hundreds of thousands of civilians in Syria, Iraq, Burundi, the Central African Republic, Sudan, South Sudan, Burma and elsewhere – we remain faced with the urgency of a world intent on tearing itself apart. As ubiquitous as genocide seems, it is a human problem and, as such, has a human solution. At its root, genocide happens because we choose to see a people rather than individual people and then we choose to kill those people in large numbers and over an extended period of time. In the midst of that bad news, the good news is that we can make another choice; we can find constructive, rather than destructive, ways to live with our diverse social identities. Preventing genocide is an achievable goal. Indeed, there is increasing interest and a growing literature outlining the ways in which we can prevent genocide in the belief that such knowledge will help shape our will do to so. The goal is to present an analysis of genocide in the modern world that draws out the lessons to be learned in preventing genocide from ever taking place, preventing further atrocities once genocide has begun, and preventing future atrocities once a society has begun to rebuild after genocide. Also to encourage all citizens, scholars, experts and non-specialists alike to understand the need to be engaged, well informed and involved, when necessary—and to understand the difference between being a bystander and being an upstander in the face of these atrocities. After all, genocide prevention is not what makes headlines, but it is what prevents the worst of headlines from being made. You are doing such a great service for our world, Jim. God bless you! !